Chain jewelry has always been popular among both men and women. Jewelry chains can be worn alone or paired with other chains, or can be accessorized with a pendant, locket, or charm. Chains can be found in the form of a bracelet, choker, or necklace. Here we describe the various types of jewelry chains and the metals used in their production. The box chain is a sturdy chain that is ideal for bearing the weight of heavy charms and pendants. Box chains consist of small boxes that are three dimensional . Each link is six sided and the boxes continuously link into the next box to form the chain. The cable chain consists of oval shaped interlocking links combined with alternating links turned at a 180 degree angle. This chain gets its name due to the resemblance to heavy duty industrial type cable chains commonly used for the purpose of hoisting anchors. The liquid silver chain is made exclusively from sterling silver. Liquid silver chains are created to produce a shimmering effect that resembles the flow of water or liquid. This is accomplished by adding very small silver beads that are shaped like a cylinder to the cord or wire from which the jewelry piece is made from. As the beads move very slightly along the strand where they are placed, it produces the liquid effect. The Herringbone chain is a very popular style of chain that is meant to be worn without the addition of any type of pendant. This chain lies flat and is typically found in bracelets and necklaces. This type of chain involves a repeated pattern of three curb links and one oval cable link. This pattern repeats itself throughout the chain. Men typically prefer this style of chain when it comes in pieces with bigger and heavier links. When smaller links are used, it can usually be worn by a male or female. The bead chain features round silver balls which form a continuous strand. The bead chain can be found in both single and multiple row styles. Some bead chains include elongated spaces or the addition of bar shaped beads to make them more attractive. Favored by male wearers, the curb chain features a heavier, larger, and more masculine looking link. The links used in curb chains are flat and interlocking. The curb chain was originally created using a larger link because of the fact the individual links took a lot of time to create because there was little machinery available to produce them. Today, smaller and more delicate styles suitable for a female can also be found. The rope chain is well loved classic chain pattern. It is a simple, yet elegant style, featuring twisted and braided fibers which form a strong chain. A strong chain suitable for holding lockets or pendants, the serpentine chain is usually made in Italy. It is a slippery and supple chain that is soft and flexible, giving it the characteristics of a snake . The Omega chain consists of evenly spaced rectangular links that spread out from the “spine” of the chain. 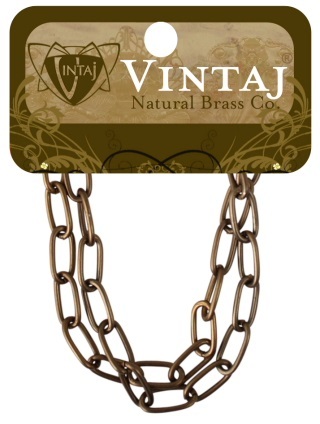 This is a flexible chain that is highly polished and typically worn near the collarbone. The Marina chain consists of oval links with a bar in the middle that interlock to form the chain. A rolo chain is comprised of symmetrical links that are joined together to create the chain. Metals commonly used in the making of jewelry include sterling silver, stainless steel, surgical stainless steel, vermeil, pewter, and gold. Jewelry chains may also consist of a base metal, which could include non-precious metals such as steel, iron, copper, brass, lead, nickel, or tin. Jewelry chains may also be coated with a think layer of gold, silver, rhodium, or nickel. These pieces would be referred to as gold-plated, nickel-plated, or silver-plated. Metals used in jewelry making that contain very little or no lead may be referred to as hypo-allergenic. As you can see, jewelry chains come in all sizes, thicknesses, and styles. They are also available in many different metals, making sure that whether you are male or female, there is always a chain that will appeal both to your particular taste as well as fit within your price range.